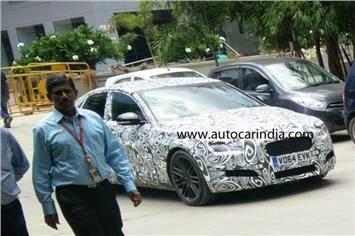 The second generation Jaguar XF which was recently unveiled at 2015 New York Auto Show has been spied in Bangalore. The new Jaguar XF is built on Jaguar’s new iQ[AI] aluminium platform. The new iQ[AI] platform uses 75 percent aluminium and has reduced 190 Kg of total weight of the car. According to Jaguar the new structure is 30 percent stiffer and gets an ideal 50-50 front-rear weight distribution. The new Jaguar XF is likely to be powered by the new 2.0 litre Ingenium petrol and diesel engines along with the regular 3.0 litre V6 diesel and petrol motors. The new XF will compete with BMW 5 Series, Merc E Class, Audi A6 and Volvo S80 in India.